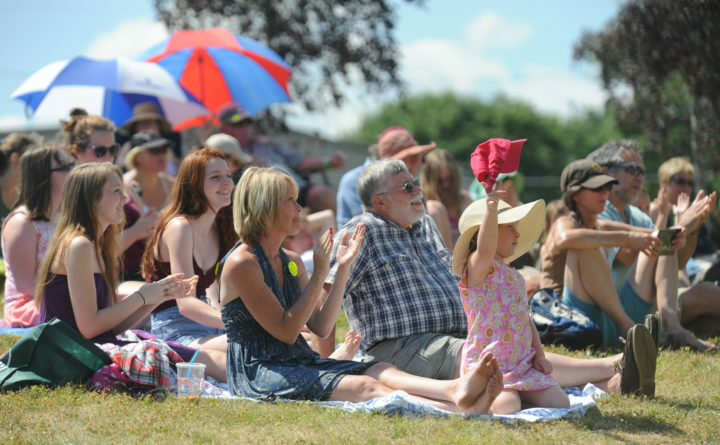 This crowd was enjoying the Celtic fusion music at the Maine Celtic Celebration in Belfast July 22, 2012. Two years ago, when organizers from the Maine Celtic Celebration contemplated the future of the popular summer event, there was a big question mark in their minds. With few people stepping up to organize the festival, nobody knew if it could continue. Even last year, finding volunteer organizers was a challenge for board members. But this summer, the lingering question mark has been replaced with an emphatic exclamation point. Thanks to the hard work of a crew of mostly newbies, the Celtic celebration is back and bigger than ever. The 12th annual festival begins Friday, July 20, and continues through Sunday, July 22. It will feature lots of live music, crowd-pleasing events such as the New World Cheese Roll Championships, and new offerings such as a sheep herding demonstration with border collies and a bagpipe showcase. 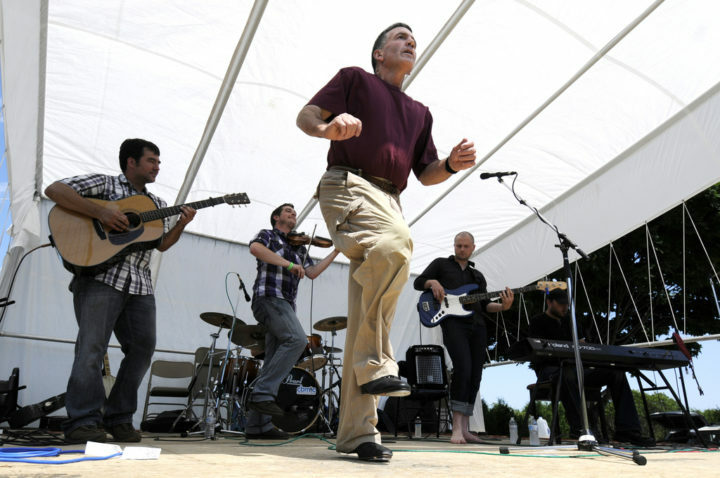 Bob McCormick of Blue Hill performs a reel dance to the Celtic fusion music of the Sprag Session, which was among the musical attractions at the Maine Celtic Celebration in Belfast July 22, 2012. The three-day annual celebration features food, music and athletic competitions -- all of which pay tribute to Maine's Celtic heritage. Over the years, the festival has animated the Belfast waterfront with music, dance, food, drink and games from Ireland, Scotland, Wales and beyond. Thousands of people attend every summer, and music groups come from all over to perform. This year, performers will include returning favorites, such as the Bangor-based Galley Rats, and first-time performers, including The Kelly Girls of Massachusetts. The latter group will be featured at a new event, a Friday afternoon performance at the Crosby Center in downtown Belfast that is specifically focused on seniors and those with mobility challenges. That performance is happening because the festival applied for and received a grant from the New England Arts Foundation. For the second year in a row, the celebration will include a medieval village demonstration from the Society for Creative Anachronism, where attendees can check out crafts, sword combat and other elements of medieval life. There’s also a boat building demonstration, a dog parade and show, and Highland Heavy Games, which include such fan favorites as the caber toss. On Saturday, the night skies will be illuminated by a firework display. The festival is free, although there is a suggested donation of $10 per person. And anyone who has a great time at the Maine Celtic Celebration is encouraged to consider volunteering their time to make it happen again next year. Luchetti is betting that if you go, you’re going to have fun. She knows she is. “I’m excited about the whole thing,” she said.